The TC15 is a two channel TC15 hand-made 15 watt amp with two VOX derived channels. It has two very different channels. One is sweet and one is tough. Channel 1 is essentially an EF86 AC15 voiced channel while channel 2 is a high gain AC30 top boost preamp. The TC15 has similarities to a Matchless DC-30 with more tonal options. The amp has enough volume to fill mid-size rooms. Common to both channels is the pull-on master volume and cut control. On the rear there is a ‘Crunch’ / ‘Munch’ toggle switch that changes the tone of the entire amp from Smooth to Crunchy and provides players with a whole new tonal palette. Channel 1 – The EF86 channel brings a new world of crunch and munch. That channel has a wonderful, meaty, midrange gain but, when you roll back the volume, it cleans up very well. It has a Volume and tone contour 6 position switch. The contour switch that takes you from Fat to Thin tone in 6 steps. NOS tube is a must-have here! Channel 2 – On this channel the original Trinity 15 sound remains with it’s high gain and clarity. This is an amplifier with a smooth tone that won’t fatigue your ears, even at high volume. At low volumes, it produces a clean and clear sound. The simple, yet interactive Bass and Treble controls provides endless tone options – enabling you to produce sparkling clean country sounds or VOX chime. Channel 2 also has a Hi/Lo gain switch. This switch is subtle, but in use really not so subtle. With a Les Paul, it may mean the difference between being able to get a truly clean tone or not – amazing and VERY useful. With a Strat, it not only cleans up the tone a bit, but also makes the amp sound like it had less headroom – a bit like the “bold/spongy” switch on a Mesa. This is cool because even though there are plenty of clean Strat tones as it is, this gives a different flavor of clean. Channels can be jumped for even more tone combinations and gain. What differentiates our kits from others is part quality, fit, documentation and support. 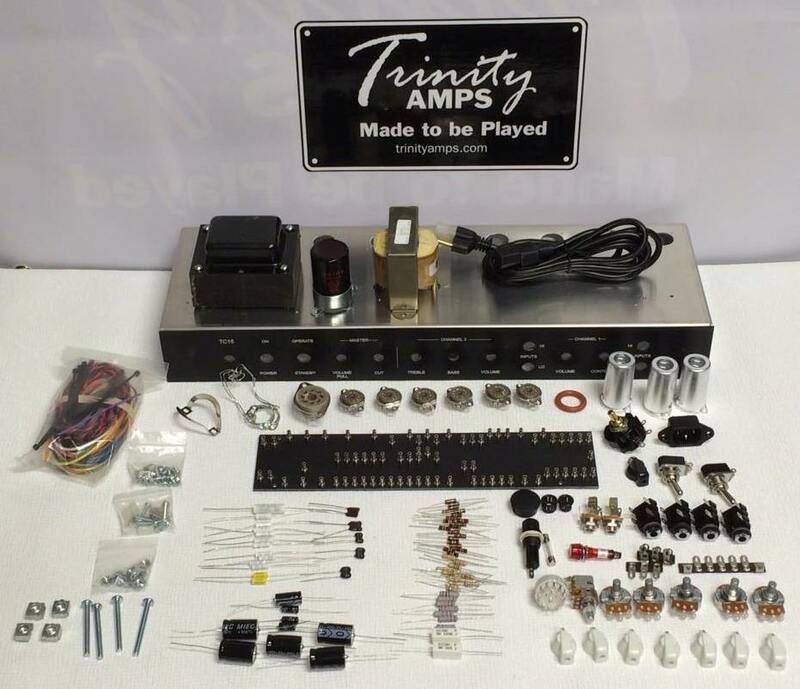 Included is all components; MALLORY 150 caps; CARBON COMPOSITION resistors; CLIFF jacks, ALPHA pots, JJ 32/32uf filter cap; Belton Micalex tube sockets; tube retainers & shields; 1/8″ thick GP03 Turret Board with large size KEYSTONE Turrets; CARLING switches; LORLIN impedance switches; All 22 gauge hook-up Wire; Pre-twisted heater wire; BELDEN Co-Ax cable; All Mounting hardware, spacers and nuts; Front faceplate Black/White with 4 Inputs; Chicken head control knobs; Pre-Cut 0.09″ Aircraft Aluminum Chassis with tapped holes for mounting screws and silk screened rear chassis; 100 Page Assembly guide; large 11″ X 17″ size layout and schematic drawings and REAL Support. The recommended but optional transformers are custom made by Heyboer to our exact specifications. This output transformer has convenient flying leads, multiple secondary windings and the primary side has been wound to 8K and 5K giving up both VOX and Matchless tone! The punched and silk-screened chassis is based on standard dimensions that fit most commercially available cabinets including Trinity Amps. Made by Heyboer to our exact specifications.